Now that we’ve covered nearly all the bases regarding Thursday’s watershed partnership with the UFC and FOX, there were a couple of interesting tidbits from Thursday’s press conference that made our minds wonder away from all of the awesomeness for just the briefest of moments. Joe Rogan hosted this morning’s presser and was forced to read his intro from a teleprompter. The popular stand-up comic is clearly better when he’s allowed to freestyle, as he stuttered several times reciting the prepared script. Rogan was also dressed in a suit. 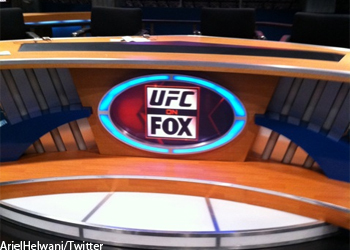 The UFC’s longtime color commentator typically dons a button-up shirt and jeans during pay-per-view broadcasts. While we’re on the fashion front, given the magnitude of today’s announcement, UFC president Dana White opted to not wear a suit. However, he was sporting a FOX Sports t-shirt to show appreciation for his new partners. Former UFC light heavyweight champ Rashad Evans was also a tad underdressed, but he appeared on camera for just a brief moment. When the camera panned across the UFC superstars that were in attendance, they introduced welterweight champ Georges St-Pierre as Frankie Edgar and then displayed the puzzled lightweight champion when announcing St-Pierre’s name. Josh Gross and Loretta Hunt, two of MMA’s longest tenured journalists, were present and allowed to ask White questions during the live press conference. Both reporters have been blacklisted from attending Octagon events for quite some time. Gross is believed to be shunned for spoiling the finalists of “The Ultimate Fighter 4,” where as Hunt authored an article while working for Sherdog.com that suggested the UFC had banned managers and agents from appearing in their clients’ locker room on fight night.